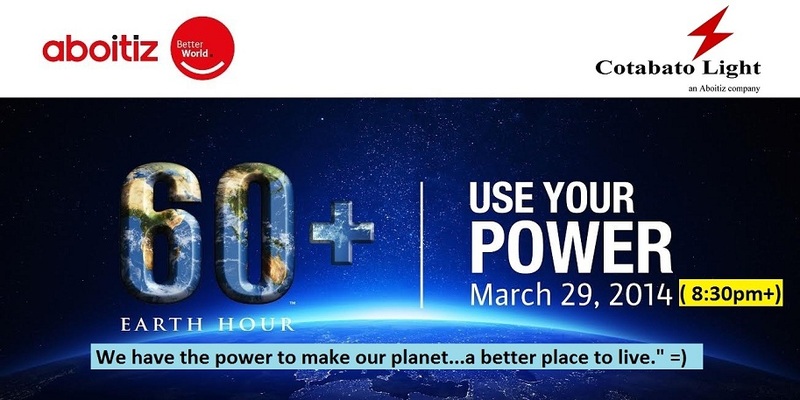 This Earth Hour campaign encourages everyone to take care of our environment and by voluntarily switching off our electricity – we can reduce our energy consumption which in turn will reduce the carbon emission of electric producing-power plants that burn fossil fuel. “There is a good side pala kapag walang kuryente – our planet Earth will have a moment to “relax and breathe”. Inaanyayahan po namin na ang lahat na makiisa sa adhikain na ito - let us all switch off our lights kahit isang oras lang.” Cotabato Light Sustainability Officer Donjie Vertuoso said. “Actually, this one-hour lights-off is just the beginning of a bigger journey – a journey to a sustainable future. There are many ways to take care of our environment – and responsible energy usage is one of it. Taking care of our environment is also taking care of our children's future. Let us embrace temporary darkness for greater and sustainable power in the future. There is light in darkness 'ika nga.” Mr. Vertuoso added. As a responsible corporate citizen, Cotabato Light will continue to promote and participate in this worldwide endeavor. Through this campaign, the aspiration for a better world is just one click away.